Enhanced efficiency fertilizers (EEF) are engineered to increase plant uptake of nitrogen (N) and reduce the potential of N loss to the environment by minimizing volatilization, denitrification and leaching. These work by controlling the release of N so it is steadily available when the plant needs it, slowing the release of N over time, or stabilizing the N to extend the time it is available for use by the plant. This steady N release and increased time of availability leads to healthier turf with enhanced greening and quality. It also reduces the number of applications and total amount of fertilizer needed to achieve the same results compared to conventional fertilizer sources. Best practices involve blending EEFs with conventional sources to achieve the desired green-up timing, optimal plant health, and extended response time. Research was conducted to observe the impact of enhanced efficiency fertilizer (EEF) on turfgrass color when applied in varying ratios to urea. 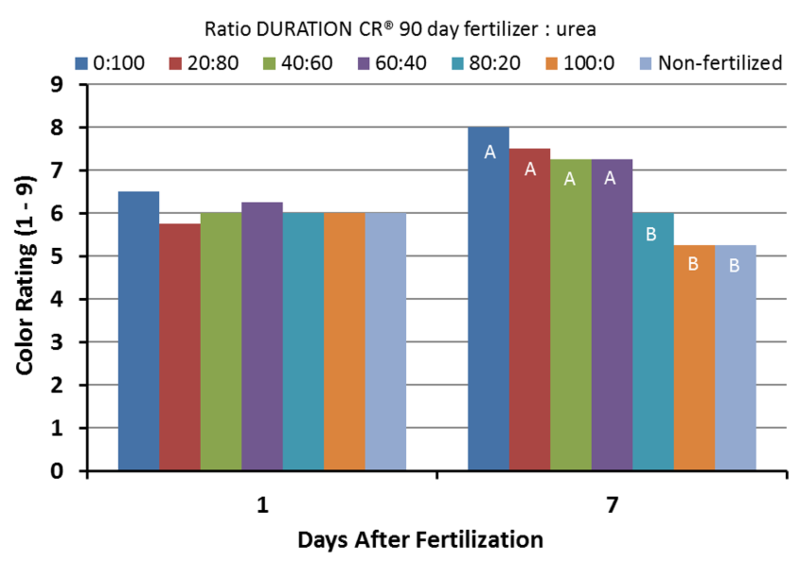 DURATION CR® 90 day controlled-release fertilizer encapsulates the urea granule in a polymer coating, therefore extending the observed plant response time. This technology is designed to extend the release rate of nitrogen up to 90 days in most cool-season turfgrass applications. Observing the appropriate color response immediately after and 7 days after application helps to support the claims that conventional and EEF sources work together to provide the most agronomic benefit. To factor in the impact on longevity, longer term data was collected to establish the threshold at which the EEF benefit is realized. Blends of urea and DURATION CR® 90 day fertilizer were made in 20% increments, from 0% to 100% DURATION CR® 90 day fertilizer. The blends were applied to Kentucky bluegrass at the rate of 1.5 lb N per 1000 ft2. Plant green-up was measured shortly following application by visual ratings (1 – 9; 1 = brown, 9 = ideal, 6 = acceptable). Plant color was measured by NDVI (Normalized Differentiated Vegetative Index) throughout the summer. This method uses an instrument that quantitatively measures plant color. The researchers then calculated the number of days required for each fertilizer blend to achieve maximum color compared to non-fertilized turf (Figure 2). This is one way to measure the longevity of a fertilizer, but note that this is not a measure of total longevity, only the number of days to reach maximum color. Numbers within the bars are the number of days to maximum color difference. Letters above the bars represent statistically significant differences (P = 0.05). Bars topped by different letters would be expected to be different 95% of the time. One day after fertilization, there were no color differences. 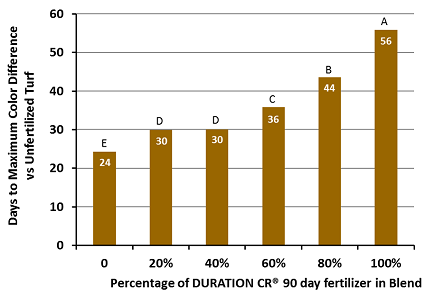 At seven days, blends containing 20% to 60% DURATION CR® 90 day fertilizer resulted in similar color to 100% urea (Figure 1, below; bars with the same letters are not statistically different). Although there were benefits to minor proportions of DURATION CR® 90 day fertilizer in the blends, a ratio of 60% DURATION CR® to 40% urea was the threshold where the real longevity value of the controlled-release technology was realized. This blend resulted in quick green-up, similar to 100% urea, and while urea reached peak color at 24 days, the 60% DURATION® fertilizer blend extended this response time by 50%. Even greater longevity was observed with higher percentages of DURATION CR® 90 day fertilizer, but initial green-up was delayed. Koch Turf & Ornamental recommends that when using slow or controlled release nitrogen fertilizers, at least 50% of the N should come from the EEF in order to realize the true benefit and value of these products. The underlying data in this university study was provided under a Research Trial Financial Support Agreement with the university. The university mentioned does not endorse or recommend any product or service.